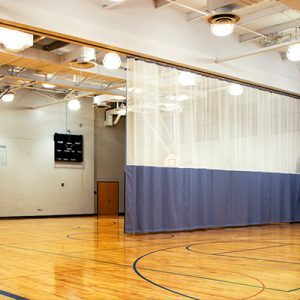 Gym Dividing: Basketball Tournament Time | Gym Equipment | QSD Inc.
Maybe this is the perfect time to transform your gym into a basketball tournament space. After all, tournaments are great fundraising opportunities. Not only will you raise funds for your school with the event itself, there are numerous wrap-around potentials with concessions, merchandise, silent auctions, 50/50 draws, etc. 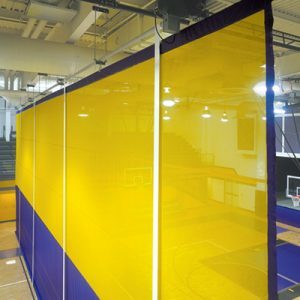 Use custom QSD floor-to-rafters gym dividers to cross-section your full-court gym into multiple 3-on-3 courts. From practice to game day, your gym can be fully engaged. Not sure where to start? Contact our knowledgeable advisors and see how easy and affordable it can be. You could do this numerous times throughout the year with a number of different sports. 3-on-3 basketball is a great example, but so too are volleyball, badminton and floor hockey. Apply your creativity. Hold a Zumba-thon with pledges for how long your competitors can stay the course. Tournaments of any type can be lean, clean, volume machines. Tournaments can vary in size depending on a range of factors. Whether yours is going to be big or small, planning makes perfect. Don’t underestimate the amount of time and personnel needed to bring it all together. To make things easier, please download our complimentary Tournament Checklist. Follow the directions and adapt the activities based on your particular need, and you’re sure to come up a winner. And make sure your next tournament is a success. You’re already drawing a crowd. Why not engage them in the moment with easy fundraising add-ons? A 50/50 raffle is a great example. Whether to increase the overall fund, or to address a specific need in the community, the 50/50 is a great way to score addition dollars. Simply set a ticket amount. Sell as many as you can on the day, and contribute 50% of the proceeds to the prize. This could be a single payout, or you could break it out into 1st, 2nd and 3rd prize (25%, 15% and 10% respectively). They’re fun, fast and they inject some friendly competition amongst the attendees. You can even use them as audience drivers by doing a residential door-to-door campaign as a promotion for the actual event.